A pharyngeal consonant is a consonant that is articulated primarily in the pharynx. Some phoneticians distinguish upper pharyngeal consonants, or "high" pharyngeals, pronounced by retracting the root of the tongue in the mid to upper pharynx, from (ary)epiglottal consonants, or "low" pharyngeals, which are articulated with the aryepiglottic folds against the epiglottis in the lower larynx, as well as from epiglotto-pharyngeal consonants, with both movements being combined. Stops and trills can be reliably produced only at the epiglottis, and fricatives can be reliably produced only in the upper pharynx. When they are treated as distinct places of articulation, the term radical consonant may be used as a cover term, or the term guttural consonants may be used instead. In many languages, pharyngeal consonants trigger advancement of neighboring vowels. Pharyngeals thus differ from uvulars, which nearly always trigger retraction. For example, in some dialects of Arabic, the vowel /a/ is fronted to [æ] next to pharyngeals, but it is retracted to [ɑ] next to uvulars, as in حال [ħæːl] 'condition', with a pharyngeal fricative and a fronted vowel, compared to خال [χɑːl] 'maternal uncle', with a uvular consonant and a retracted vowel. In addition, consonants and vowels may be secondarily pharyngealized. Also, strident vowels are defined by an accompanying epiglottal trill. *A voiced epiglottal stop may not be possible. When an epiglottal stop becomes voiced intervocalically in Dahalo, for example, it becomes a tap. Phonetically, however, voiceless vs voiced affricates or off-glides are attested: [ʡħ, ʡʕ] (Esling 2010: 695). ** Although traditionally placed in the fricative row of the IPA chart, [ʕ] is usually an approximant. Frication is difficult to produce or to distinguish because the voicing in the glottis and the constriction in the pharynx are so close to each other (Esling 2010: 695, after Laufer 1996). The IPA symbol is ambiguous, but no language distinguishes fricative and approximant at this place of articulation. For clarity, the lowering diacritic may used to specify that the manner is approximant ([ʕ̞]) and a raising diacritic to specify that the manner is fricative ([ʕ̝]). For transcribing disordered speech, the extIPA provides symbols for upper-pharyngeal stops, ⟨Q⟩ and ⟨ɢ⟩. The so-called "Epiglottal fricatives" are represented [here] as pharyngeal trills, [ʜ ʢ], since the place of articulation is identical to [ħ ʕ], but trilling of the aryepiglottic folds is more likely to occur in tighter settings of the laryngeal constrictor or with more forceful airflow. The same "epiglottal" symbols could represent pharyngeal fricatives that have a higher larynx position than [ħ ʕ], but a higher larynx position is also more likely to induce trilling than in a pharyngeal fricative with a lowered larynx position. Because [ʜ ʢ] and [ħ ʕ] occur at the same Pharyngeal/Epiglottal place of articulation (Esling, 1999), the logical phonetic distinction to make between them is in manner of articulation, trill versus fricative. Edmondson et al. distinguish several subtypes of pharyngeal consonant. Pharyngeal or epiglottal stops and trills are usually produced by contracting the aryepiglottic folds of the larynx against the epiglottis. That articulation has been distinguished as aryepiglottal. In pharyngeal fricatives, the root of the tongue is retracted against the back wall of the pharynx. In a few languages, such as Achumawi, Amis of Taiwan and perhaps some of the Salishan languages, the two movements are combined, with the aryepiglottic folds and epiglottis brought together and retracted against the pharyngeal wall, an articulation that has been termed epiglotto-pharyngeal. The IPA does not have diacritics to distinguish this articulation from standard aryepiglottals; Edmonson et al. use the ad hoc, somewhat misleading, transcriptions ⟨ʕ͡ʡ⟩ and ⟨ʜ͡ħ⟩. There are, however, several diacritics for subtypes of pharyngeal sound among the Voice Quality Symbols. 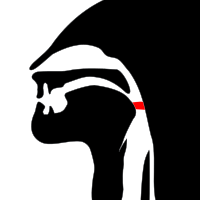 Although upper-pharyngeal stops are not found in the world's languages, as far as is known, they occur in disordered speech. Pharyngeals are known primarily from three areas of the world: in the Middle East and North Africa, in the Semitic (e.g. Arabic and Hebrew), Berber and Cushitic (e.g. Somali) language families; in the Caucasus, in the Northwest, and Northeast Caucasian language families; and in British Columbia, in Haida and the Salishan and Wakashan language families. There are scattered reports of pharyngeals elsewhere, as in Central (Sorani) and Northern (Kurmanji) Kurdish, Marshallese, the Nilo-Saharan language Tama, the Siouan language Stoney (Nakoda), and the Achumawi language of California. In Finnish, a weak pharyngeal fricative is the realization of /h/ after the vowels /ɑ/ or /æ/ in syllable-coda position, such as [tæħti] 'star', but that is mere allophony. The approximant is more common, as it is a realization of /r/ in such European languages as Danish and Swabian German. According to the laryngeal theory, Proto-Indo-European might have had pharyngeal consonants. The fricatives and trills (the pharyngeal and epiglottal fricatives) are frequently conflated with pharyngeal fricatives in literature. That was the case for Dahalo and Northern Haida, for example, and it is likely to be true for many other languages. The distinction between these sounds was recognized by IPA only in 1989, and it was little investigated until the 1990s. ^ Kodzasov, S. V. Pharyngeal Features in the Daghestan Languages. Proceedings of the Eleventh International Congress of Phonetic Sciences (Tallinn, Estonia, Aug 1-7 1987), pp. 142-144. ^ John Esling (2010) "Phonetic Notation", in Hardcastle, Laver & Gibbon (eds) The Handbook of Phonetic Sciences, 2nd ed., p 695. The reference "Esling, 1999" is to "The iPA categories 'pharyngeal' and 'epiglottal': laryngoscopic observations of the pharyngeal articulations and larynx height." Language and Speech, 42, 349–372. ^ a b Edmondson, Jerold A., John H. Esling, Jimmy G. Harris, & Huang Tung-chiou (n.d.) "A laryngoscopic study of glottal and epiglottal/pharyngeal stop and continuant articulations in Amis—an Austronesian language of Taiwan"
^ Nevin, Bruce (1998). Aspects of Pit River Phonology (PDF) (Ph.D.). The University of Pennsylvania.